This is the amount of avocadoes that Jack and I eat each week, approximately 2 day. 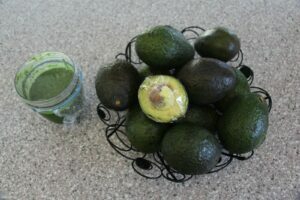 I mix half of one into my green smoothie, with spinach, kale, cucumber, spirulina, and pea shoots (tender pea sprouts). We have been doing a keto-Paleo type of food plan wherein we have upped our fat intake by quite a bit. Jack is consuming as much as 80% fat in a day and I am consuming about 60% fat in our macronutrient ratios. Jack’s weight has dropped by 6 pounds and he is maintaining that weight loss (his weight started to creep up a little from his off-season weight now that we have retired from bodybuilding competition). My weight is being maintained at my off-season weight from bodybuilding competition. My struggle was having a hard time staying warm, even in the summer. Eating more healthy fat has given me more energy, less sugar cravings and I actually feel warmer now in the winter months. There is some great writing and research showing the benefits of a ketogenic way of eating and we are both feeling great on this slightly modified Paleo way of eating. We are actually eating a little less protein because the higher amount of fat makes us feel more satisfied for a longer period of time without eating. 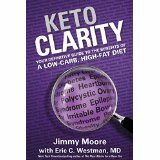 A great resource for learning about what a ketogenic diet is all about is Jimmy Moore’s book, co-written with Dr. Eric C. Westman. There are several keto cookbooks out now that feature some delicious recipes on how to eat on a ketogenic diet. Aside from weight loss benefits, many people are reporting that they have improved blood lipid profiles and a lot more energy.